New data from NASA’s Galileo spacecraft, which orbited Jupiter between 1995 and 2003, indicates the gas giant’s moon Ganymede is located in a tumultuous magnetic environment that may be the cause of its bright auroras. Galileo, which flew by Ganymede six times between 1996 and 2000 and collected data on the large moon using sophisticated science instruments, surprised scientists by revealing that Ganymede has its own magnetic field. While most solar system planets have magnetic fields, Ganymede is the only moon known to have one. Magnetospheres are the regions around planets dominated by their magnetic fields, which protect them from harmful solar and interstellar radiation. The probe’s Plasma Subsystem or PLS, studied the flow of plasma, electrically charged gas flowing around Ganymede, and measured the plasma’s density, direction, and temperature. Ganymede and its magnetosphere are enveloped within Jupiter’s much larger magnetosphere, which provides protection from the solar wind. Jupiter’s magnetosphere, whose plasma flows slowly, also controls the shape of Ganymede’s magnetosphere, which it sculpts into a long shape that extends in the direction of the moon’s orbit. While planets’ magnetospheres are ordinarily shaped by pressure from speeding particles of the solar wind, Ganymede’s is instead determined by the magnetosphere of its parent planet. 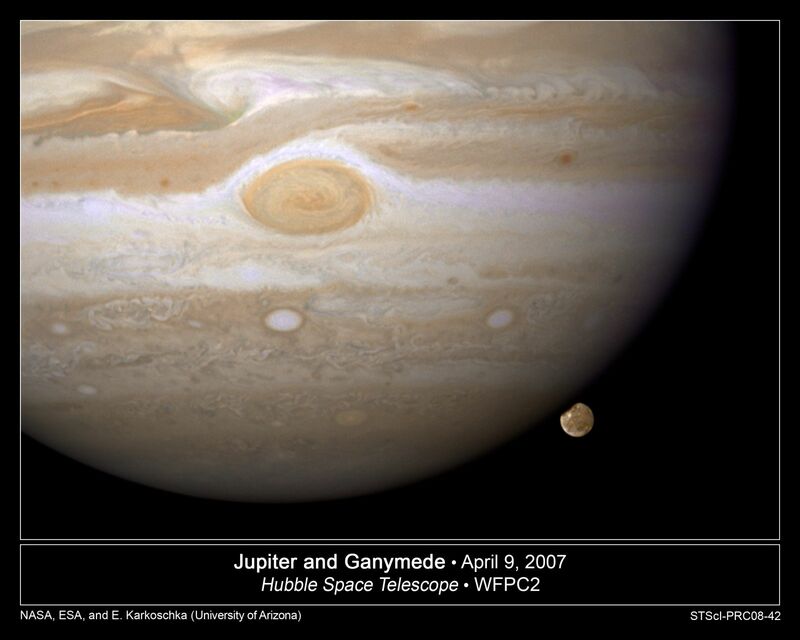 Jupiter and Ganymede, April 9, 2007, Hubble Space Telescope WFPC2. Photo Credit: NASA, ESA, and E. Karkoschka of the University of Arizona. As Galileo flew by Ganymede, the probe was hit by high-energy particles accelerated by Jupiter’s magnetosphere. These particles also bombard Ganymede, falling onto its poles. There, the moon’s magnetic field directs the particles to its surface. While newly analyzing PLS data, scientists discovered that plasma rain is falling onto Ganymede’s icy surface, from where it is ejected back into space. “There are these particles flying out from the polar regions, and they can tell us something about Ganymede’s atmosphere, which is very thin. It can also tell us about how Ganymede’s auroras form,” said Bill Patterson, of NASA’s Goddard Spaceflight Center in Greenbelt, Maryland, and a member of Galileo‘s PLS team. Explosive interactions between the magnetospheres of Jupiter and Ganymede cause plasma to flow strongly between the planet and moon and may be the reason for Ganymede’s very bright auroras. Because they protect planets from harmful radiation and prevent atmospheric erosion, magnetospheres might be necessary for the development of life. A better understanding of them will help scientists search for possibly habitable worlds in both our solar system and others. Like Earth, Ganymede has northern and southern auroras; however, these come from plasma surrounding Jupiter rather than from the solar wind, as occurs on Earth. When Galileo flew over the regions experiencing auroras, it detected ions falling onto the polar caps. That detection helped scientists pin down the exact locations of the auroras by observing Ganymede with the Hubble Space Telescope (HST). 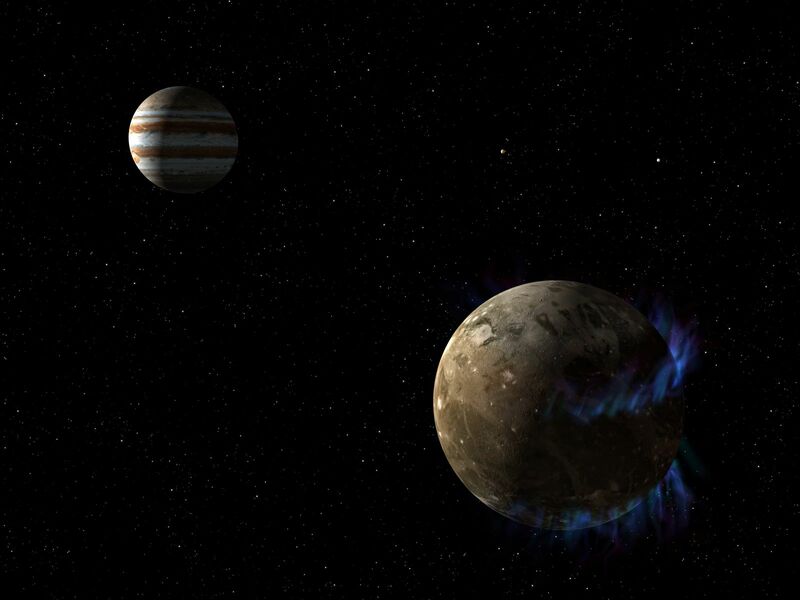 Galileo also detected an instance of magnetic reconnection, in which strong flows of plasma between Jupiter and Ganymede connected with one another, pumping the plasma toward Ganymede’s poles and creating the bright auroras. PLS data collected during this reconnection may also provide scientists with a better understanding of the subsurface ocean for which both Galileo and Hubble found evidence. That ocean is protected by Ganymede’s magnetosphere. The new findings are discussed in a paper published in the journal Geophysical Research Letters. Great article about one of two solar system moons larger than Mercury! Hey, wait, why is Mercury a planet, but not Pluto? Maybe the definition of a planet circa 2006 is bunkum!